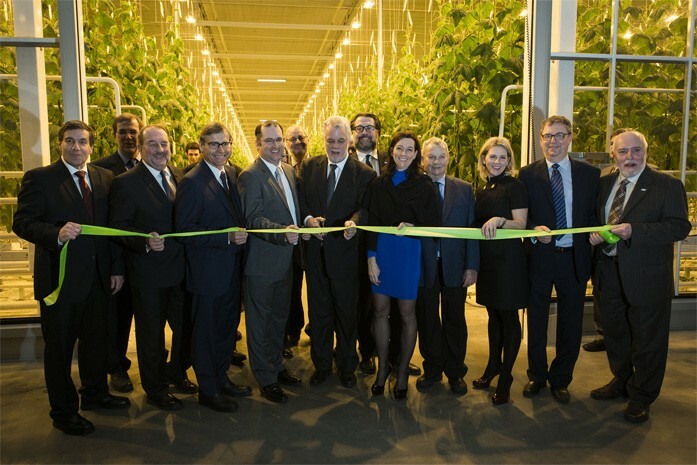 Quebec’s largest greenhouse complex with year-round production is now officially inaugurated. Resolute and Toundra Greenhouse leadership, accompanied by the Premier of Quebec, government officials and local business partners, today officially inaugurated the greenhouse complex destined to become the largest in Quebec. Located on land adjacent to Resolute’s Saint-Félicien pulp mill, Toundra Greenhouse is a cucumber-growing complex in which Resolute owns a 49% joint-venture interest. Upon completion, the C$100 million, four-phase project will cover 4 million square feet (35 hectares) and create over 500 jobs. The complex already covers about 1 million square feet (8.5 hectares), employs 100 workers and has an annual production capacity of over 45 million Lebanese and English cucumbers. “What’s unique about this greenhouse is that it covers 25% of its heating needs by using heat waste from our Saint-Félicien mill. At full capacity, Toundra Greenhouse will be able to lower its heating costs, while we will reduce our greenhouse gas emissions at a rate equivalent to taking over 2,000 vehicles off the road per year,” said Resolute President and Chief Executive Officer Richard Garneau. The achievement of this ambitious, innovative project required the participation of local investors who understand the major challenges facing rural communities and the importance of ensuring economic diversification. Over 50 Saguenay−Lac-Saint-Jean businesses were involved in developing the project and making it a success; the Quebec government, and in particular Premier Philippe Couillard, also played a key role in the creation of the complex. The ultimate goal of Toundra Greenhouse is to make Quebec a self-sufficient producer of the vegetables it consumes, thereby reducing imports from outside the province. Now that production has begun, it will be able to compete with Mexico, California, Spain and Ontario, which, up to now, supplied 95% of the cucumbers consumed in Quebec. Toundra Greenhouse uses Dutch technology, the world’s best greenhouse production technology in terms of productivity and reduced environmental impact. To view the Toundra Greenhouse video, click here. For more information about Toundra Greenhouse, visit www.serrestoundra.com.